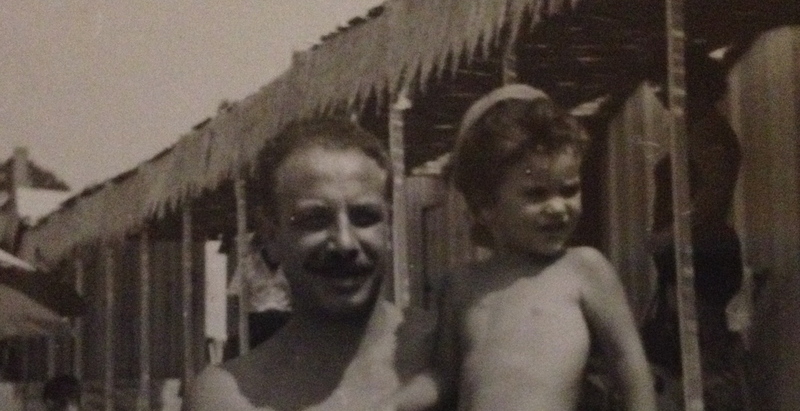 Today is Father’s Day in USA and although in Italy we celebrate this holiday on March 19th, it feels appropriate to dedicate this post to my father. It was June 5, 1998, it was a sunny afternoon and I was sitting on the sideline of the soccer field where my children were training. Unexpectedly, I saw my husband walking toward me, his expression was gloomy and when he asked me to step aside, my heart skipped and I just knew that something terrible had happened. My father, 4600 miles away, had died, suddenly, of a stroke. I don’t need to explain what or how I felt then, but today what still hurts the most, is that I could not say goodbye. No time for tears, just let me tell you about the Ragú Napoletano, that wonderful, comforting slow cooked meat-based sauce, synonym of pranzo della domenica (Sunday family supper). 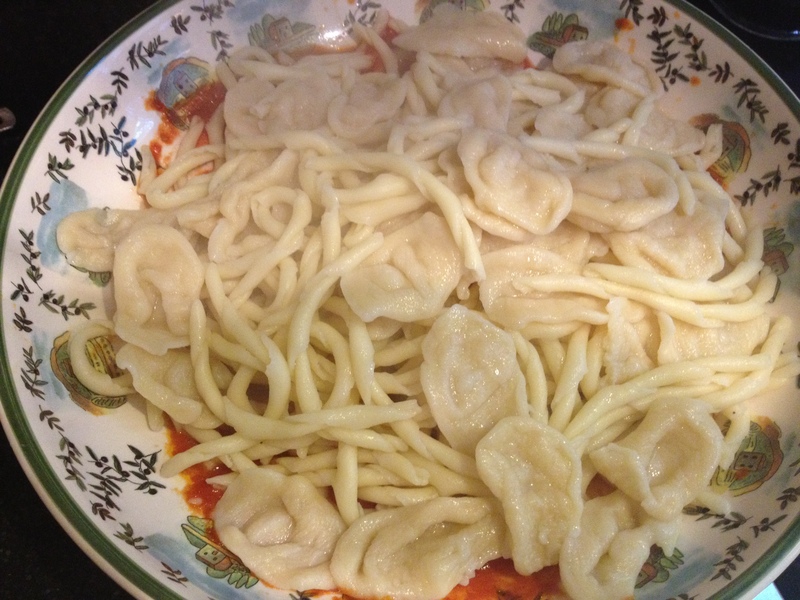 My mother was an excellent cook and she would make handmade pasta, tagliatelle, gnocchi, fusilli, strascinati, orecchiette . . . like no other, yet my father was the king of the ragú. 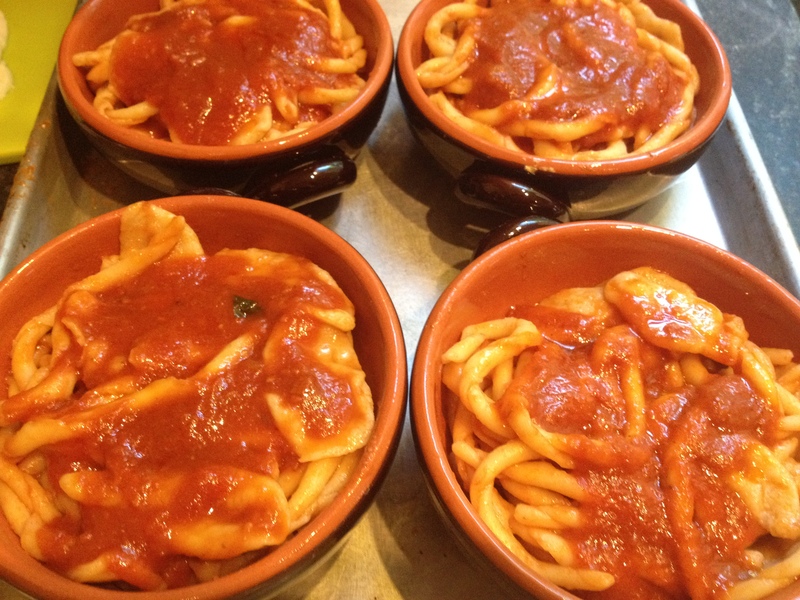 My father would wake up at 5:30 AM every Sunday and after his caffè and his first cigarette he would start the ragú. 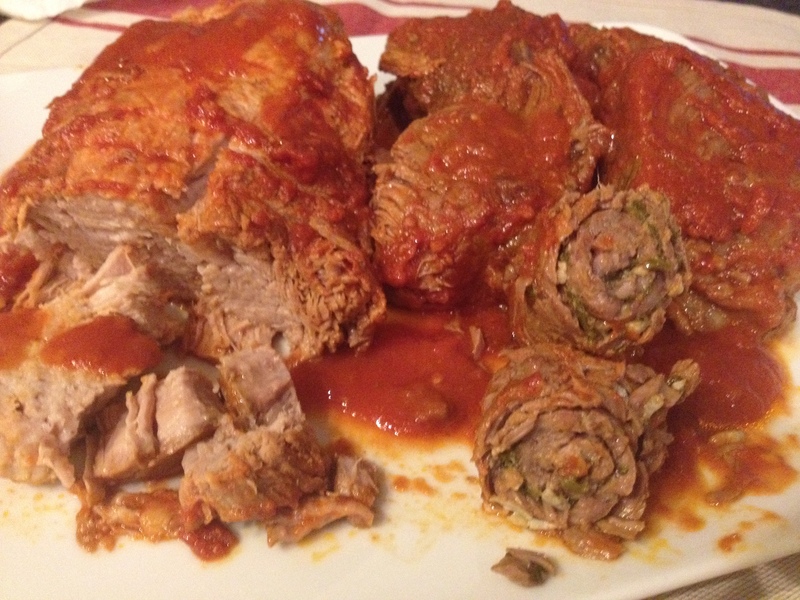 First he would prepare the braciole (slice of meat rolled -up), one made with beef and one with cotica (pork rind). He would season them with with garlic, salt, pepper, parsley, pine nuts, raisins and grated cheese. 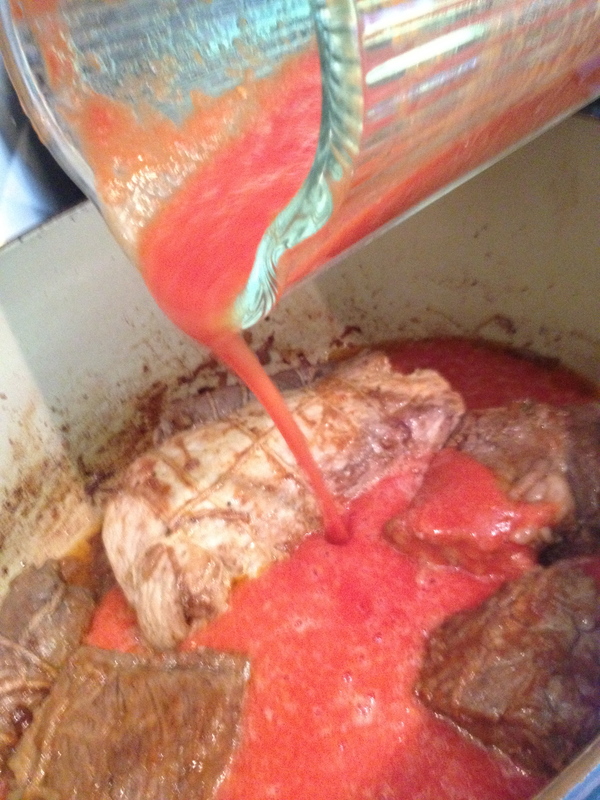 The braciole, along with the rest of the meat, were going in the pot with the onions, then the wine, last the passata di pomodori (tomato pureed) – which we usually bottled at the end of summer. For the next 4-5 hours, my father would tend to the ragú like it was a work of art . . . 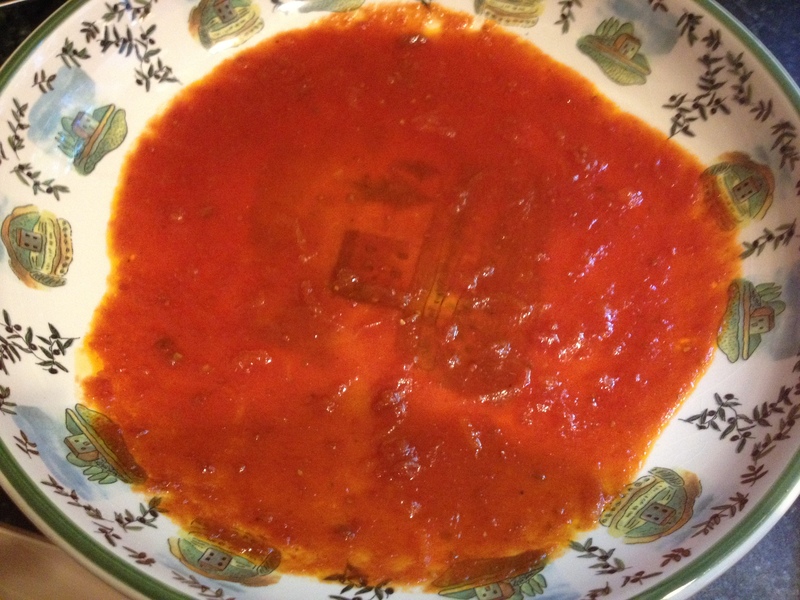 Letting the sauce pippiare – an onomatopoeic word that describes the sound of the sauce that barely simmer producing tiny bubbles – stirring once in awhile, tasting for salt and pepper. 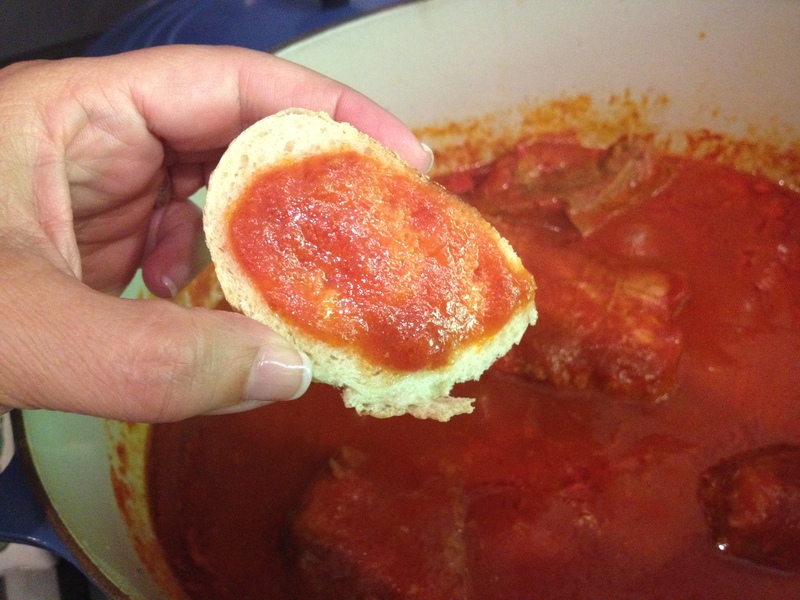 My brothers and I would wake up to the aroma of the ragú and my best treat of the morning was a small slice of bread smothered with sauce. 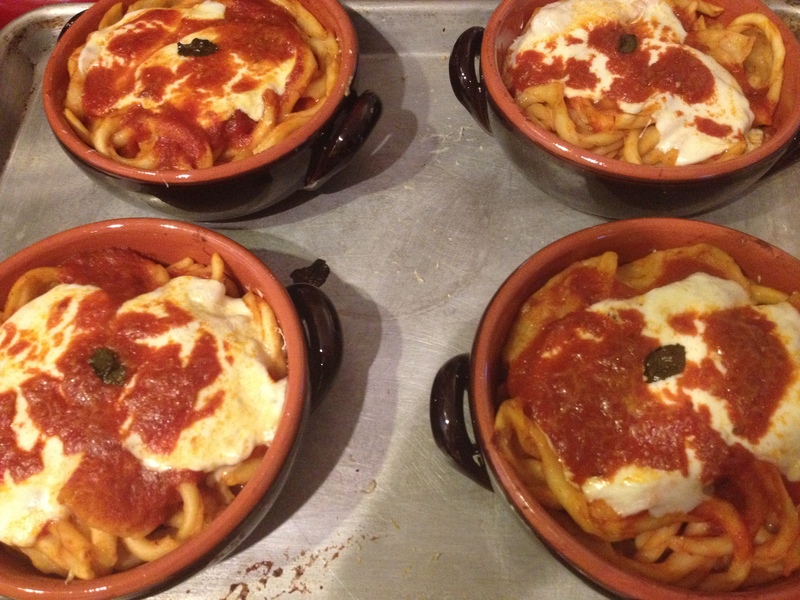 The sauce usually serves as condiment to the ziti spezzati – my mom used to buy the long ziti and it was my job to cut them into short pieces – or to the paccheri, or to the handmade pasta that my mom had prepared. The meat, covered with sauce, was the second course along with the obligatory patatine fritte (fried potatoes) and insalata verde – just plain green lettuce – simply seasoned with olive oil and squeezed lemon. 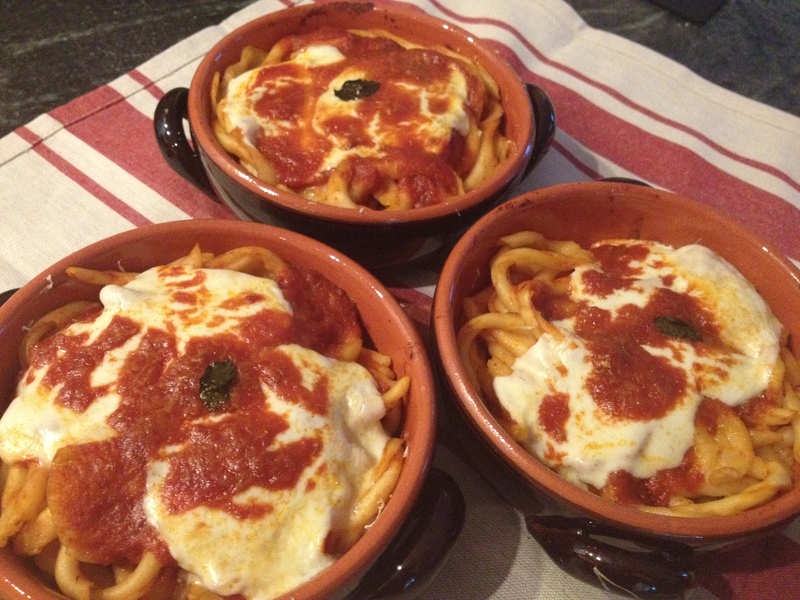 Now, to find an original, traditional recipe of ragú it is not easy task, so I have always relied on my memories and some research. 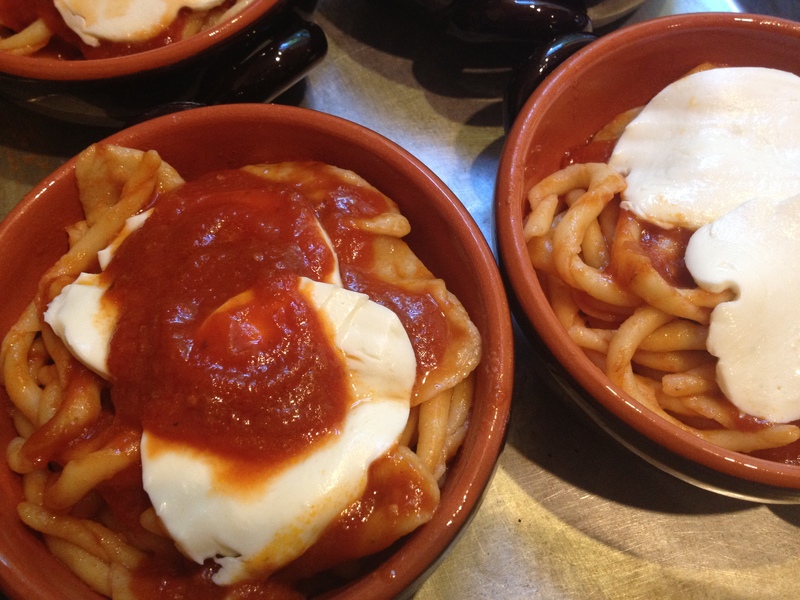 The ragú, is prepared with large pieces of meat that are browned together with a lot of onions. The choice of meat cuts seems to be the main issue, and not just for me . . . If you have 3 minute to spare, you might enjoy this clip from Sabato Domenica Lunedì, an Italian movie, starring Sofia Loren. Rosa Priore (Sofia Loren) is shopping for the perfect ingredients for ragú; in the macelleria (butcher shop), she gets into an argument with another client about which meat cuts to use. I am sorry the clip is in Italian – actually Neapolitan – however, tone of voices and expressions tell it all . . . and who doesn’t want to see the beautiful Sofia Loren! Italian meat cuts have such distinctive names, cappello del prete, piccione, locena and so on, that I often find very difficult to translate them into an English equivalent. So many times, I show up at the butcher counter with a meat chart and I point out the cuts I need. So here is a picture for you. Scamone (#14 – beef rump), annecchia (veal stew), one slice of locena (#2 – beef brisket), noce di vitello (#16 – veal sirloin), pork ribs, and one piece of cotica (pork rind). In my recipe, I follow the traditional cooking method, however, I do not use the lard – originally used instead of olive oil – and the pork rind. 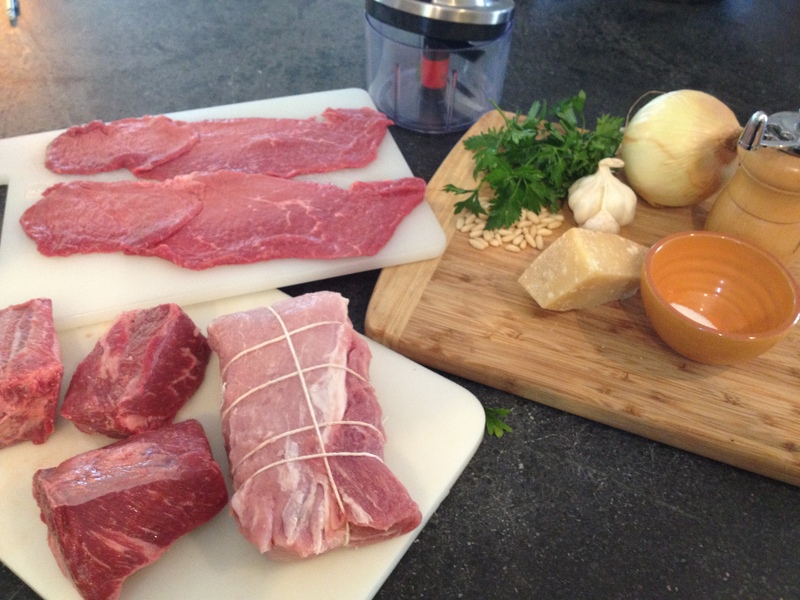 For the meat cuts, on this particular day, I used what I found available – pork and beef. Keep in mind that I often cook for only 3-4 people therefore I need to adjust my recipes accordingly. 1 large slice of brisket (#2) not too thick. 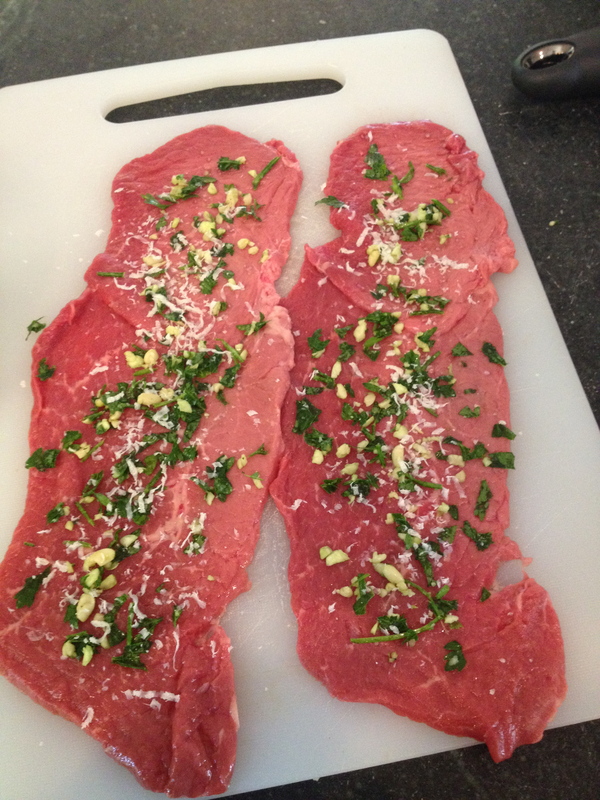 First prepare the braciola: lay the slice of meat on a chopping board, season with salt and pepper. Add parsley (hand-chopped), pine nuts, raisins, and grated cheese. 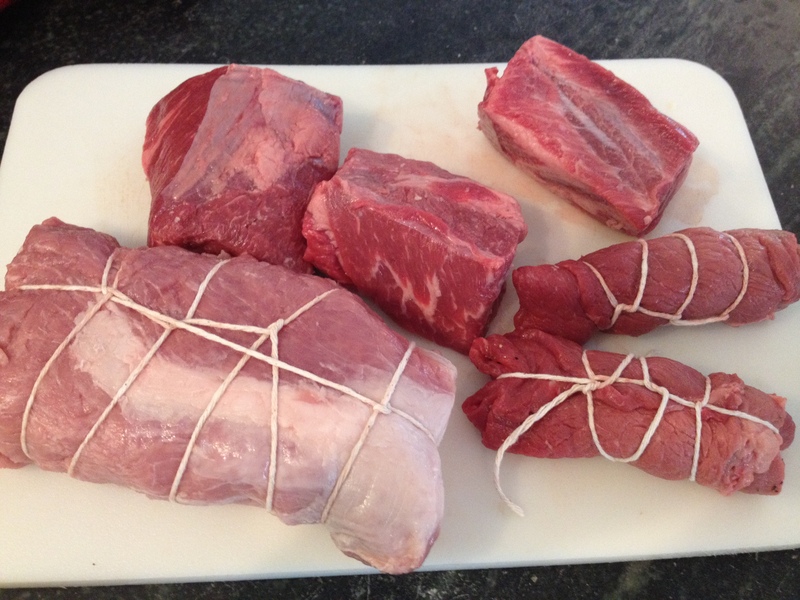 Roll-up the meat and tie with cooking twine. Season the rest of the meat with salt and pepper. Tie the large pieces with cooking twine to keep the shape. In a large pot heat the oil and melt the butter. Add the sliced onions and the meat at the same time. 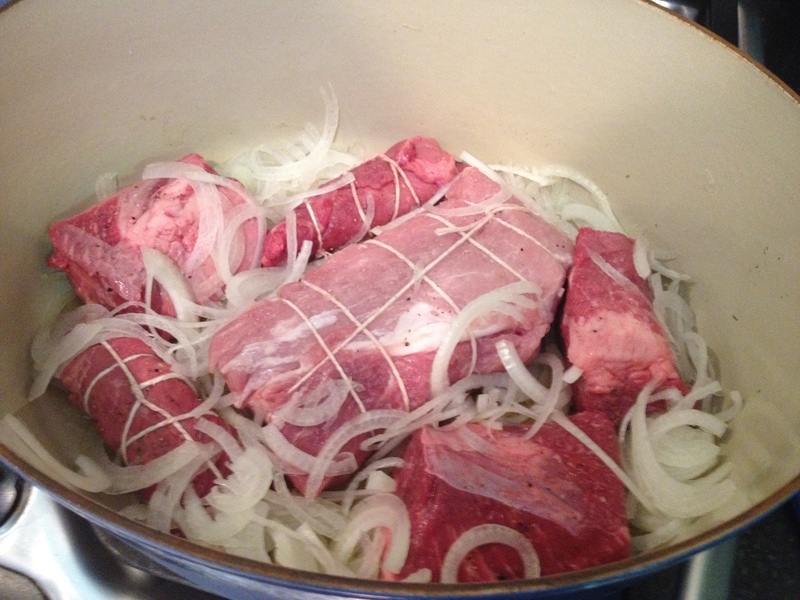 On medium heat let the meat brown and the onion soften until almost disappear. To achieve a perfect result you must tend to each step with care. During this first step you must be vigilant, don’t let the onion dry, stir with a cucchiaia (wooden spoon) and start adding wine if necessary to keep moist and facilitate the melting of the onions. 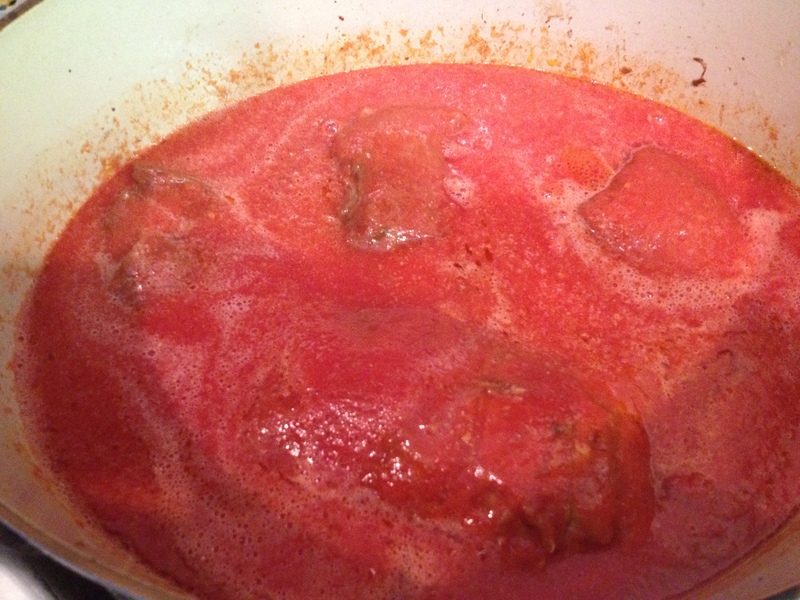 Once the onions have dissolved and the meat has browned, add the tomato paste and a little wine to dissolve it. Stir and combine the ingredients. Let cook slowly for 10 minutes. Time to add the tomatoes pureed, season with salt and black pepper and stir. Cover the pot but leave the lid ajar, you can place a wooden spoon under the lid. 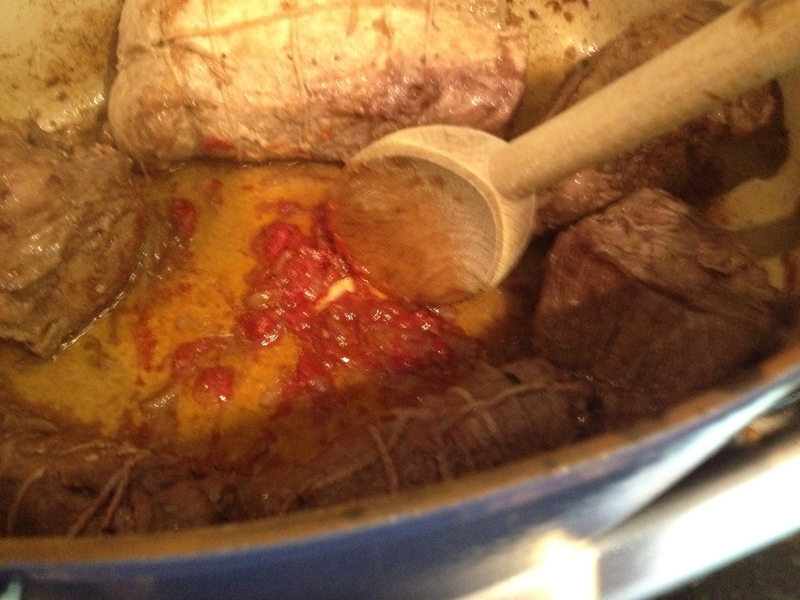 The sauce must cook very slowly for at least 3-4 hours. 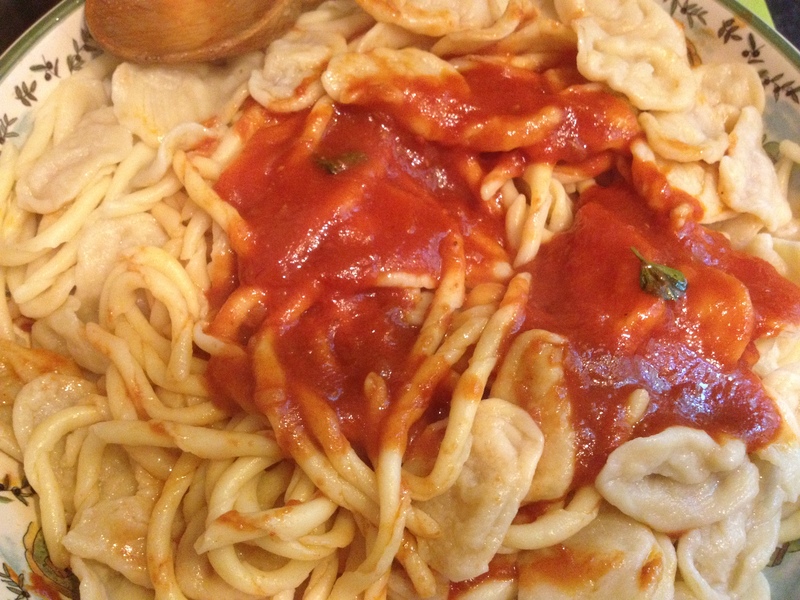 Remember, as they say in Naples, the sauce must “pippiare”. Pippiare . . . can you see the tiny bubbles? After 2 hours add few leaves of basil and continue cooking. IMPORTANT: Half way through, don’t forget to dip a piece of bread into the sauce and have your first taste of heaven! During these 3-4 hours you must keep tending to the ragú, stirring once in awhile and making sure that it doesn’t stick to the bottom. 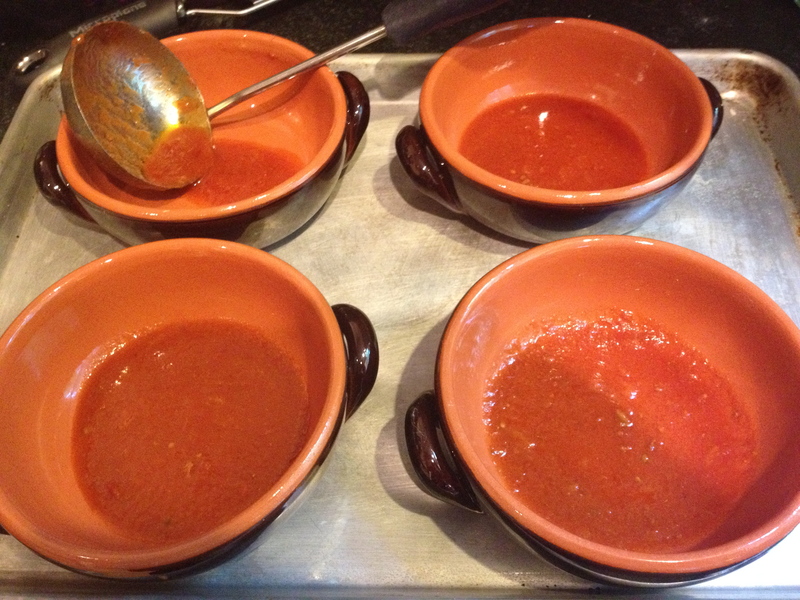 The sauce, as I mentioned can be use as condiment for different kind of pastas. This sauce is also used in the preparation of the lasagna napoletana and the parmigiana di melanzane (eggplant parmigiana). 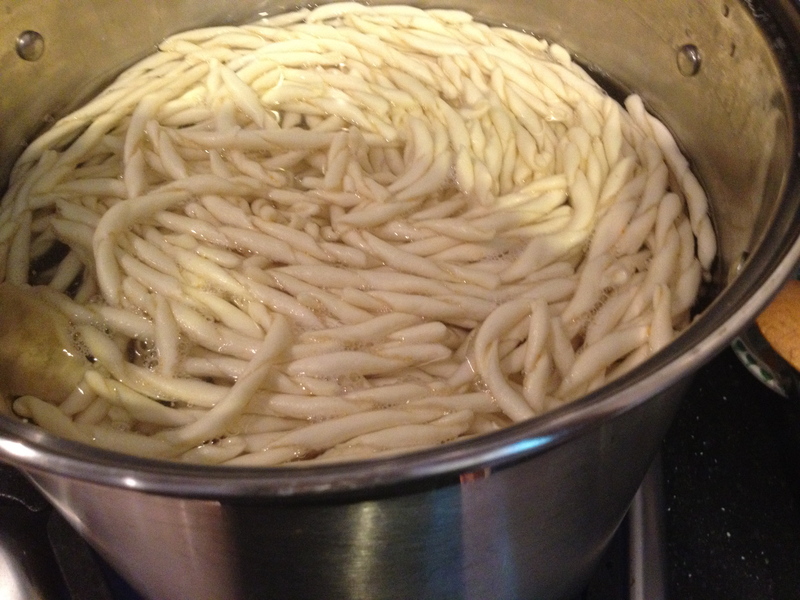 On this particular occasion, I used my ragú to make fusilli e strascicati al tegamino – my husband had just returned from Italy and brought me back these fresh homemade pasta. See in pictures the steps and final product. Before I leave . . .HAPPY FATHER’S DAY TO ALL THE DADS!!! 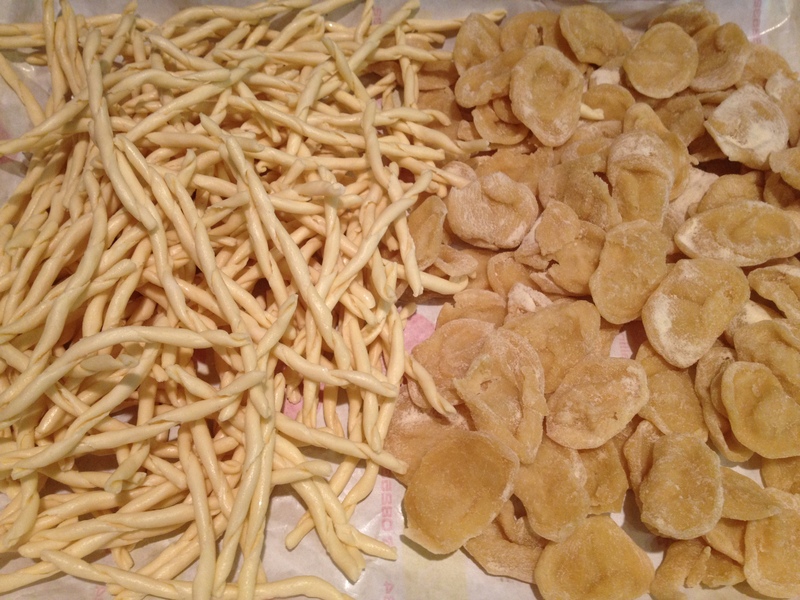 Fusilli and Strascicati directly from Italy! Ciao MariaGiovanna! 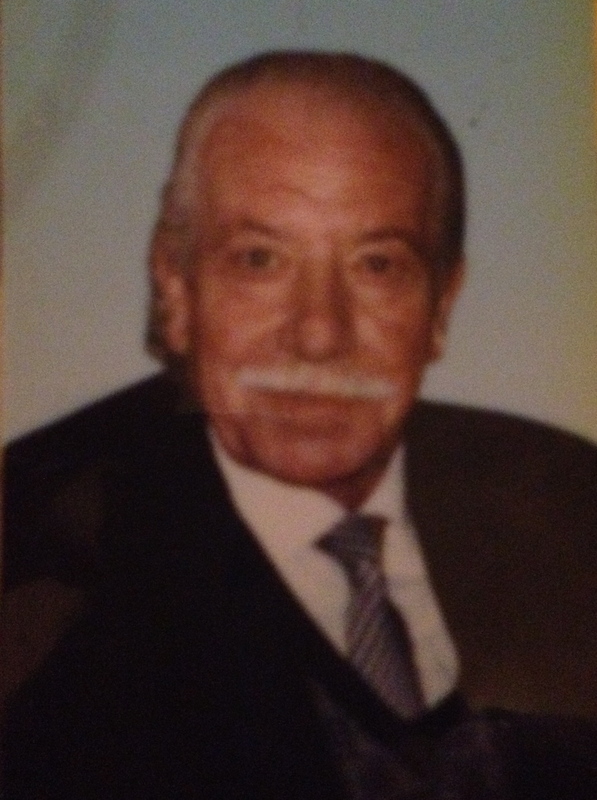 Thank you so much for sharing this sweet memory of your babbo! I enjoyed reading it so much and wanted to tell you how much you helped me. 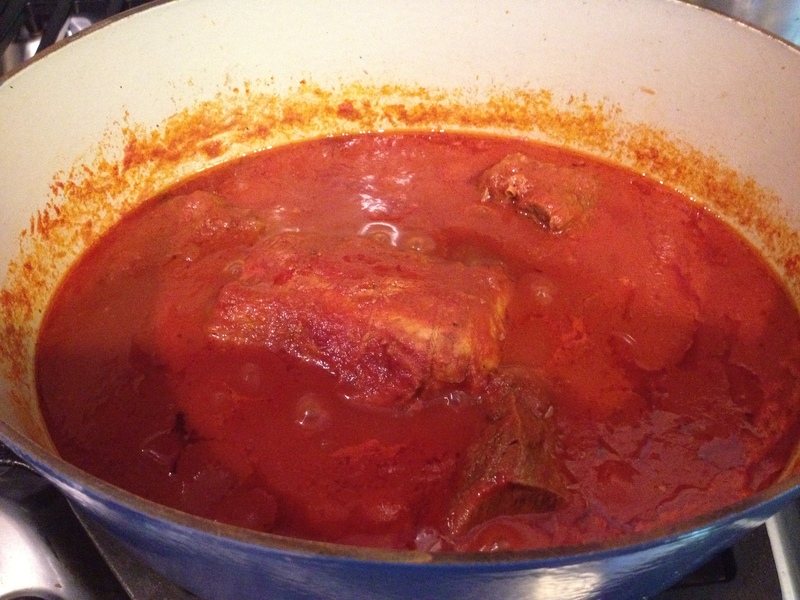 My mother, who was from Puglia, made a delicious ragu that she always wanted me to learn. I watched her and even wrote her recipe down but never really tried to make it until after she passed. I finally did attempt it a couple of times but never came close. After several years I decided to try again and searched the internet for some help. 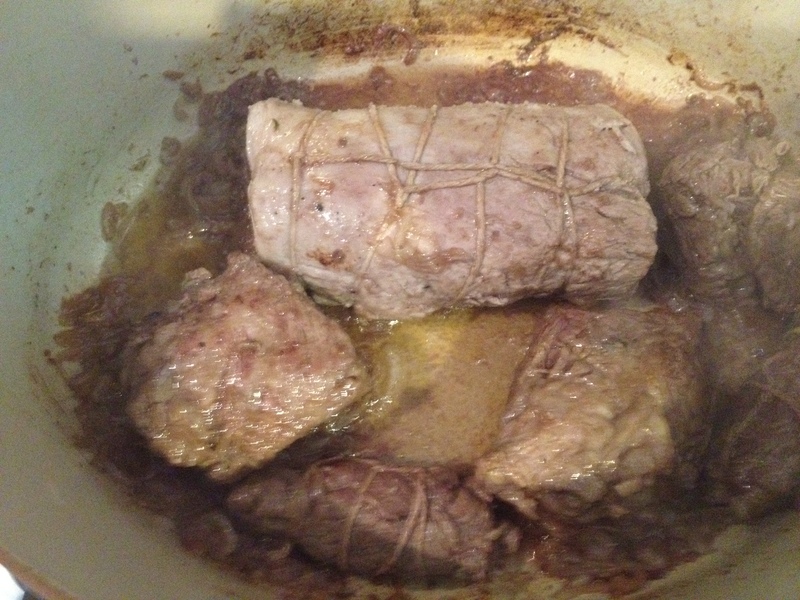 I found your blog and saw that your recipe was very similar to Mamma’s (she never made braciole). I used it as a guide (thank you for posting photos!) 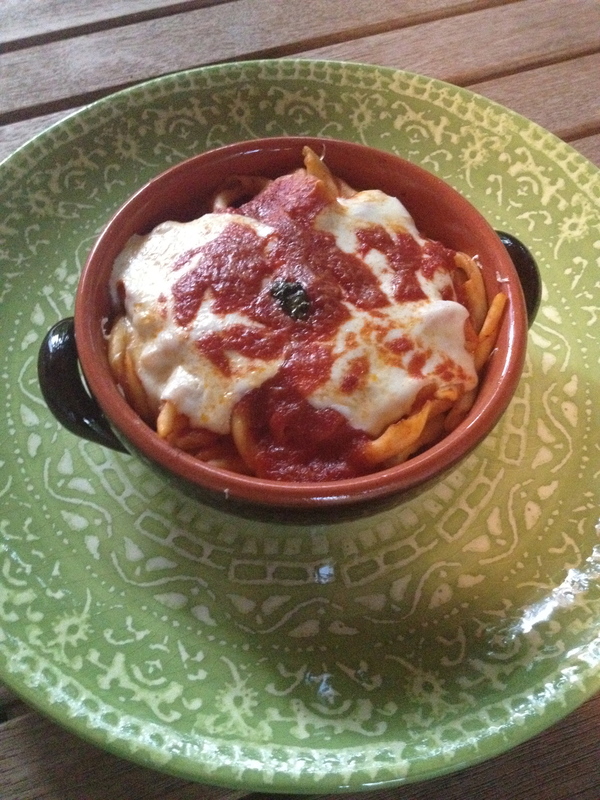 and what I remembered and much to my and my family’s delight, the ragu came out very much like hers! My mother was such a phenomenal cook, I don’t think I could ever get it exact. But it was so wonderful to smell and taste it again! And I felt so close to her as I prepared it and many happy memories came flooding back! Thank you again for sharing and I wish you and your family all the best! First let me apologize for the long delay in my reply. Life has been crazy and I had not been able to keep up with my blog. I am slowly attempting to come back to it. Anyway, I am so happy you find my blog but mostly I am happy that my recipe has allowed you to not only recreate your mom’s rage but also to feel such a strong connection with her. She must have been a special lady! Thank you for taking the time to write to me, I truly appreciate it. Wishing you all the best as well! No apologies necessary and I’m so glad you’re attempting to come back to your wonderful blog! No apology necesssry! And I’m so happy you’re attempting to get back to writing your wonderful blog! Grazie…sarò a Milano tra un mese! 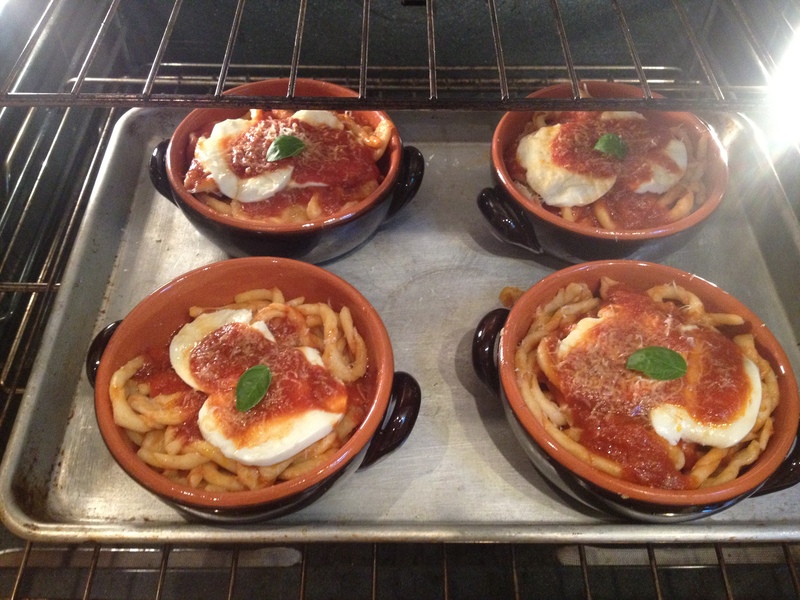 This is a great post and recipe! I will need to bookmark this for future reference. Can’t wait to read more of your blog, as I’m embarking upon my first Italy trip in a couple of months! So glad you enjoyed the post and that you are following my blog. I hope you will find it useful in your upcoming trip . . . how exciting? Don’t forget to enter my book giveaway, it’s a beautiful book on Puglia; follow the link for details. 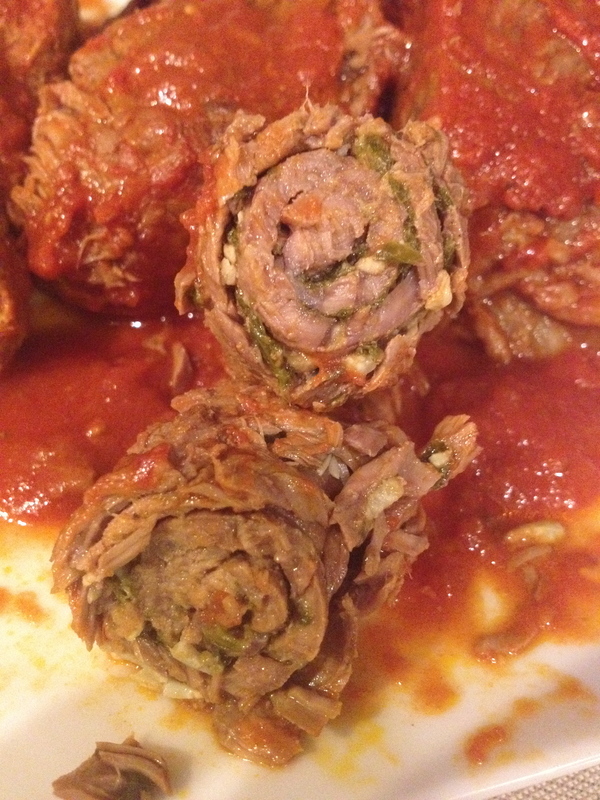 WE also put bread crumbs and cheese in our rolled up Braciole. My grandparents were from Bari and Spinazzola. I am sure they were delicious! I LOVE the picture of your dad! A truer Italian gentlemen could not be captured on film. And, my goodness, but you have poured yourself into this ragu and this recipe. Thank you for your dedication! Thank you, I love his picture on the bike. 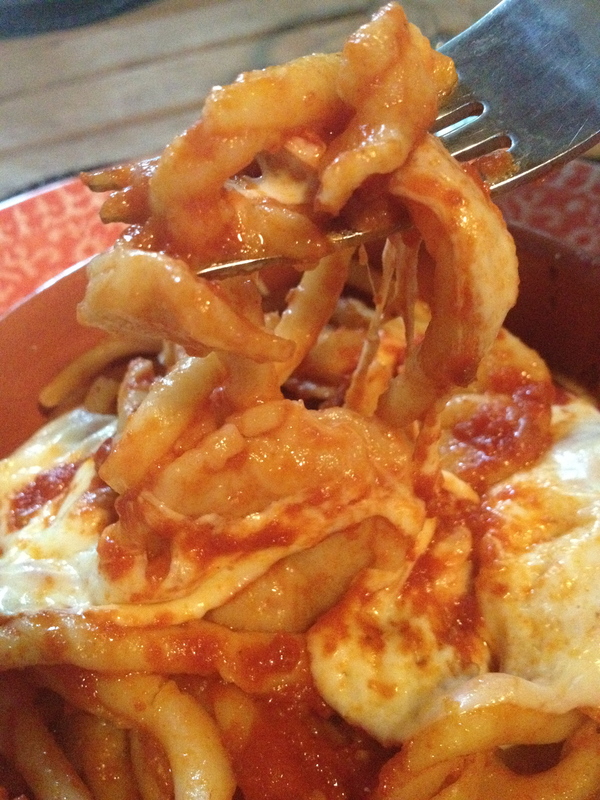 And, Oh my God, now that you remind me, my mom used to make fried eggs in sauce too! So glad you have been enjoying my blog. It’s a wonderful site with fantastic, authentic recipes. Well done! I can only laugh as I picture you walking into the local supermarket in the USA and showing them the Cow Chart!!! LOL! Thanks for sharing a touching story, that ends with food. Is that not the way? Food and memories go hand in hand! LOL yes it quite funny but true! And you are right, I can relate most of my recipes to a memory – happy or sad – and I guess that’s what I am trying to share. I hope you enjoy that. Bellissimo! Che ridere quel film! Mi fa piacere ti sia piaciuto! Life can be so poignant… Your pictures look so delicious, and the film clip is really cute and funny. Thanks for a great post! Glad you liked it. Thank you for visiting. Have a nice afternoon!